Jew of the second century C.E. ; eminent both as a scholar and for the part he took in the affairs of his time. From references to the religious persecutions which he endeavored to terminate it would appear that he became prominent during the time of Hadrian, when the government had forbidden the observance of the Sabbath and of circumcision as well as the use of women's baths (Me'i. 17a). 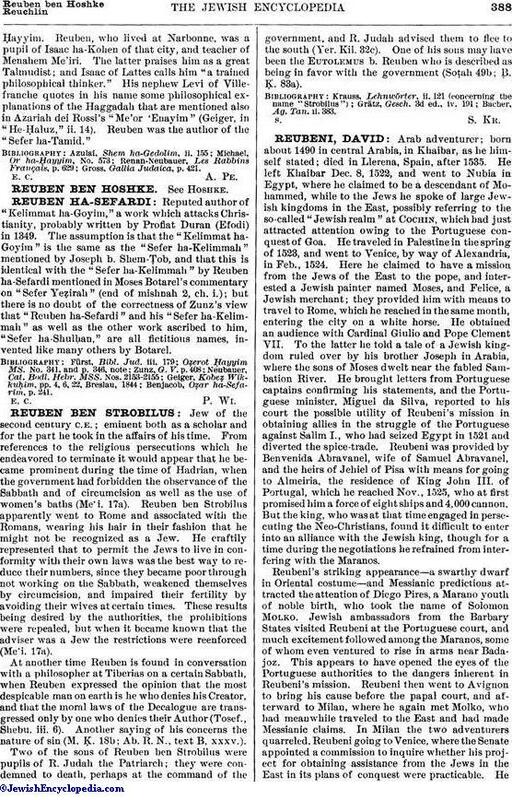 Reuben ben Strobilus apparently went to Rome and associated with the Romans, wearing his hair in their fashion that he might not be recognized as a Jew. He craftily represented that to permit the Jews to live in conformity with their own laws was the best way to reduce their numbers, since they became poor through not working on the Sabbath, weakened themselves by circumcision, and impaired their fertility by avoiding their wives at certain times. These results being desired by the authorities, the prohibitions were repealed, but when it became known that the adviser was a Jew the restrictions were reenforced (Me'i. 17a). At another time Reuben is found in conversation with a philosopher at Tiberias on a certain Sabbath, when Reuben expressed the opinion that the most despicable man on earth is he who denies his Creator, and that the moral laws of the Decalogue are transgressed only by one who denies their Author (Tosef., Shebu. iii. 6). Another saying of his concerns the nature of sin (M. Ḳ. 18b; Ab. R. N., text B, xxxv.). Two of the sons of Reuben ben Strobilus were pupils of R. Judah the Patriarch; they were condemned to death, perhaps at the command of the government, and R. Judah advised them to flee to the south (Yer. Kil. 32c). One of his sons may have been the Eutolemus b. Reuben who is described as being in favor with the government (Soṭah 49b; B. Ḳ. 83a). Bacher, Ag. Tan. ii. 383.